Anything for our boys in blue! Great report, well done that man. Not very Napoleonic, but a great report with nicely done illustrations. Tgunner, it is the 7.62 "Bren" or LMG (We usually just said Bren) It had a different Flash Eliminator, straighter Magazine and different rear sight to the classic .303 WW2 Bren. Thanks all so much for the kind comments. 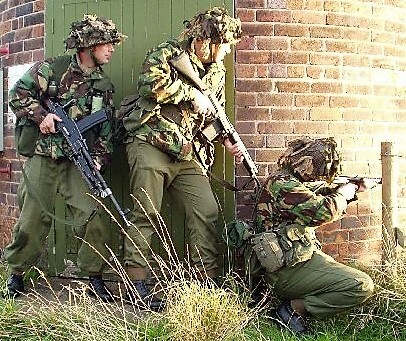 Yes the 7.62 LMG was in use in many British infantry units in 1985 – lighter and more accurate than the GPMG, but perhaps less firepower. Sorry for the accidental cross post to Napoleonic's! I always look forward to you reports…they're some of the best out there. Sorry for the accidental cross post to Napoleonic's!" I would be very surprised to learn the LMG was still in general use with regular infantry units in 1985. Our Close Observation Platoon (COP) used it in Northern Ireland but that was one platoon in the whole battalion. I would like to see verifiable citations before believing it was used by BAOR units during the mid 80s. As for the Bren, I knew it looked familiar right off, though I'm not ex-military. My only surprise was that I had thought it had been left behind in the late 40's, early 50's. But I cant blame Wiki, its impossible to 'certify' every article. Great stuff mate, be stealing that scenario i think.